Filmed with a gopro at So Hombu Dojo, with Irie Soke, Seamark Kysohi and Eric Shihan. Thank you to A. Shahkar for the Use of the Gopro and Eric Shihan for being an awesome Uke. 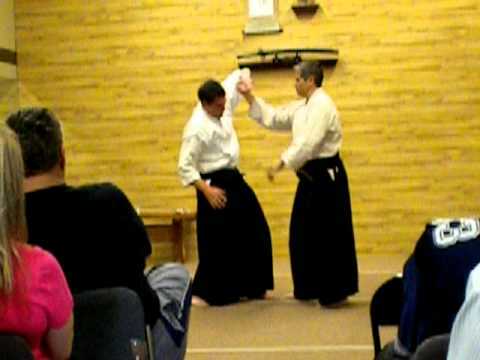 A demo of Kokodo Jujutsu done by my dojo for relief efforts in Japan, 2011. Special thanks to Georg Klinger for creating the video and the entire Kokodo Jujutsu family for showing the spirit of budo. Jujutsu ( joo-JOOT-soo; 柔術) is a Japanese martial art and a method of close combat for defeating an armed and armored opponent in which one uses no weapon or only a short weapon. "Jū" can be translated to mean "gentle, soft, supple, flexible, pliable, or yielding." "Jutsu" can be translated to mean "art" or "technique" and represents manipulating the opponent's force against himself rather than confronting it with one's own force. Jujutsu developed to combat the samurai of feudal Japan as a method for defeating an armed and armored opponent in which one uses no weapon, or only a short weapon. Because striking against an armored opponent proved ineffective, practitioners learned that the most efficient methods for neutralizing an enemy took the form of pins, joint locks, and throws. These techniques were developed around the principle of using an attacker's energy against him, rather than directly opposing it.